It’s Monday and I’m ready to share another little project I have been working on with Tara over at 4th Grade Frolics. I haven’t shared a lot of my creations because I am still trying to figure out where everything is going in the classroom. I start my back-to-school meetings this week so I probably won’t be ready to take pictures until the weekend. Before I begin this post, it is only fair to let you know that this idea was inspired by Reagan over at Tunstall’s Teaching Tidbits. Click here to see the post that started it all. I wanted my second graders to have a traveling class pet this year. I wanted to encourage some writing at home and thought this might be a good way to get that started. I looked around for the perfect pet. One day I was in Target with my daughter and these two little faces were peeking out at us from the aisle. So, I wanted a class pet. I got two. You might be asking why. Originally I thought of using one of the dogs as a back-up. Then I realized if I had TWO class pets, they would travel to all the homes in the classroom twice as quickly. The students would not be waiting as long to have their turn. I had two composition notebooks and got to work. I found some cute puppy-themed scrapbook paper, took photos of the pets individually, and sat down to type the letter for the front of the journal. 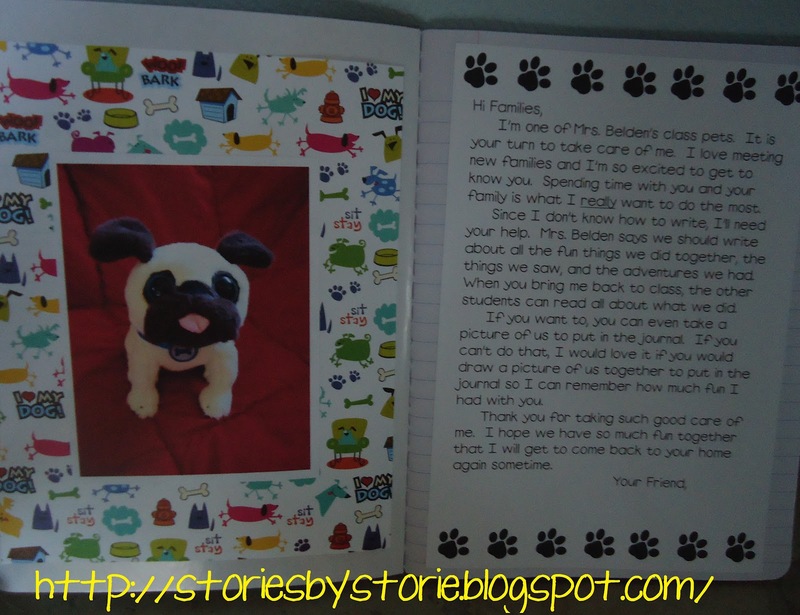 My letter is written to the families from the class pet. You will notice that the letter has not been signed. I am going to have the students help name our class pets once school begins and then the pets will sign their names to the letters. It has my name throughout, but if you want me to send you a copy, leave me a comment with your e-mail so I can send it to you. I love these books – I'd love to see a copy of your letter if you don't mind! Very cute idea! The students will love these little pets!